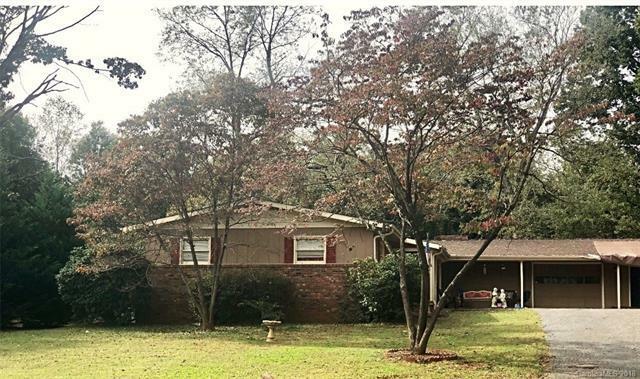 3 bedroom ranch w/ basement located in quiet neighborhood. NO HOA! Low taxes! A long blacktop driveway leads up to the home and its attached two car, 700 sqft garage. The covered front porch welcomes you! Well organized and efficient eat-in kitchen with cabinets and counter space galore! Appliances included! Fridge, dishwasher, microwave, and a Jenn-Air cooktop in the huge center island. Gas log fireplace surrounded by brick, adorns the wall of the dining area. Great room with soaring cathedral ceiling allows for big furnishings, flexible furniture placement, and access to the screened porch which overlooks the private, level, fenced back yard. Partially finished basement w/interior and exterior entrances features a rec/flex space, 2 rooms for an office/music studio, full bath with Jacuzzi tub, laundry room, one car garage, workshop, and storage! Roof, and water heater replaced in 2014. Roof over garage is brand new! (Due to Hurricane) Easy access to I-77. Great location! Great value!